The possible applications for drones are growing every day. From watching out for poachers in wildlife parks in Africa to delivering textbooks to students, the autonomous flying machines are tackling problems both big and small. The ability for the drones to have onboard sensors and HD cameras makes them ideal tools for mapping and surveillance. Taking that idea to the extreme, engineers from senseFly, partnered with Drone Adventures, Pix4D and Mapbox, were able to create a digital model of the Matterhorn with a 20-cm resolution in three dimensions. 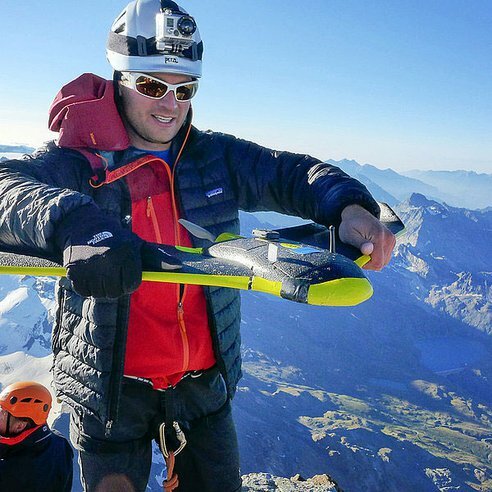 Two teams took the company's eBee drones to the mountain with Team 1 hiking to the summit and launching the devices to fly around the top of the peak. Team 2 launched eBees from the bottom of the mountain to cover the lower parts of the mountain. 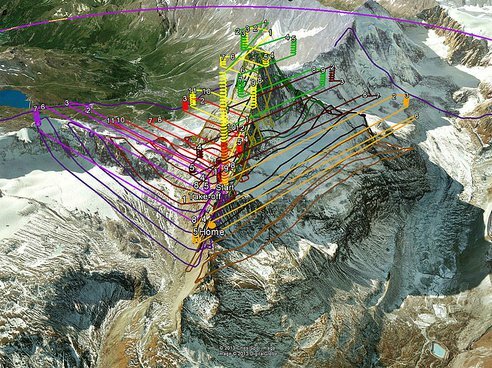 SenseFly says, "The main challenges successfully overcome were to demonstrate the mapping capabilities of minidrones at a very high altitude and in mountainous terrain where 3D flight planning is essential, all the while coping with the turbulences typically encountered in mountainous environments." For the project, 11 flights were made totaling 340 minutes. The drones took 2,188 photos and created an HD point-cloud with 3 million datapoints. The company's eMotion2 software provided the ground control for the flights, automatically creating flight paths for the multiple drones. You can watch a video about the project below and see how the mapping and flight planning took place. Google Earth has provided many an office worker with several consecutive hours of procrastination material – “Ooh, there’s my house! And my mum’s house! 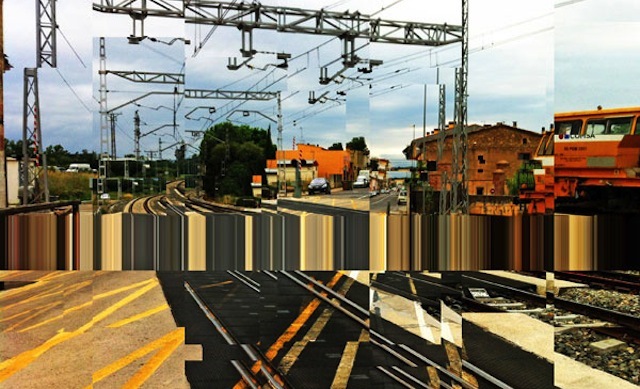 And my nan’s house!” – and these examples of glitches, curated into one handy Flickr account by Trapcode founder Peder Norrby, are fascinating in their weird digital distortion of landscapes the world over. The glitches aren’t really glitches of course but logical misalignments which occur as a result of texture mapping, when a two-dimensional image is applied to the surface of a three-dimensional model. They’re created by an algorithm, rather than human beings, explaining the oddly dehumanised images they present. 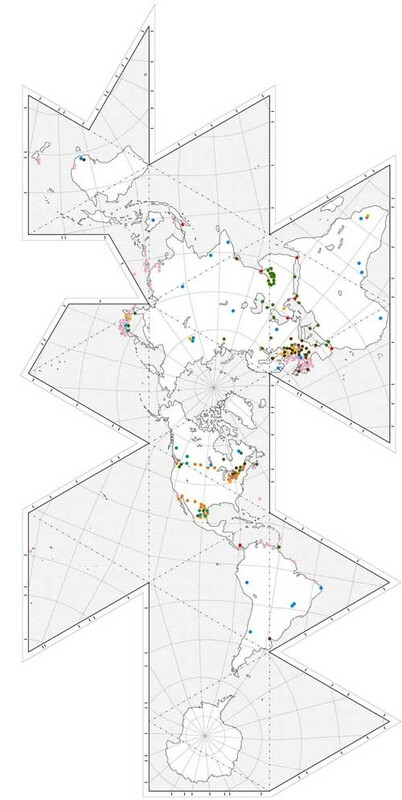 The result of these robots creating maps of the world? Trees melting into houses, bridges bending under the weight of cars that cross them and street corners that resemble the scary red slide from Playworld. Like peeping into a weird, dystopian parallel universe, the images are strangely alluring in their interpretations of the changing representations of the Earth’s surface. *I’m guessing this rig won’t show up on a fashion catwalk any time soon. And Googles glasses on the catwalk at NY fashion week. This is what our state lines might look like if we drew them based on who actually talks with each other, at least according to cell phone data gathered by MIT. These are the geographic clusters of who texts with whom within an area, from the MIT Senseable City Lab's Connected States of America mapping project. If volume of communication determined state lines, New York City would break ranks with the state that shares its name and join up with oft-maligned New Jersey. Mississippi and Alabama would merge, so would most of New England. Wisconsin would split in two to join Illinois and Minnesota. But one can also look at how a given regions talk with other regions, and how close those ties are, distance factored in. The map below is of Los Angeles' connections to the rest of the country. 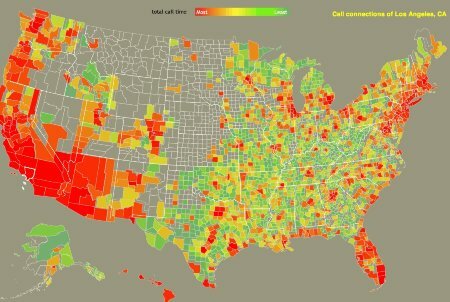 Red areas are those with the most connections to L.A. according to cell phone conversations. 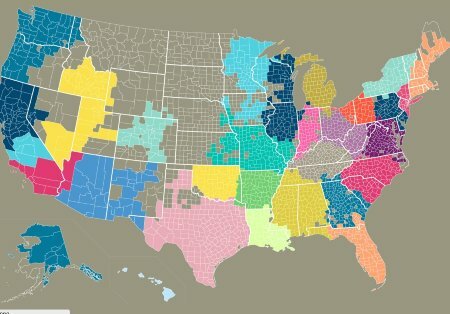 The Connected States of America project's interactive maps and visualizations show us how different parts of the country interact, and raise the question, what is a community? There was a simple answer 60 years ago when geography determined who you talked with, bonded with, and spent your life with. Now that families are scattered across the country for college, jobs, or wanderlust, and companies set up bi-coastal offices without a second thought, that's no longer true. Should we care that the people we're most connected with aren't necessarily nearby? 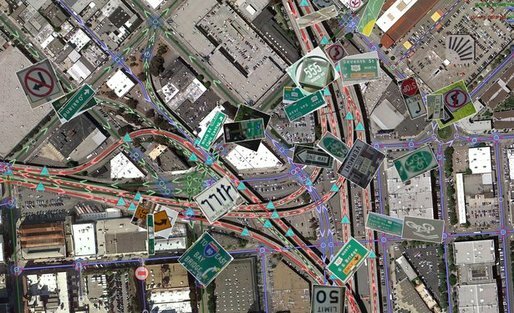 Play around with the maps at MIT's site. For a little inspiration, watch this short video. 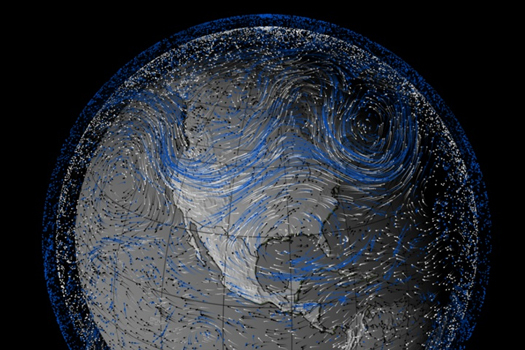 Beautiful evolving wind geographies and wind maps (weather data) by NASA (even if in this case, they are about catastrophic weather events). 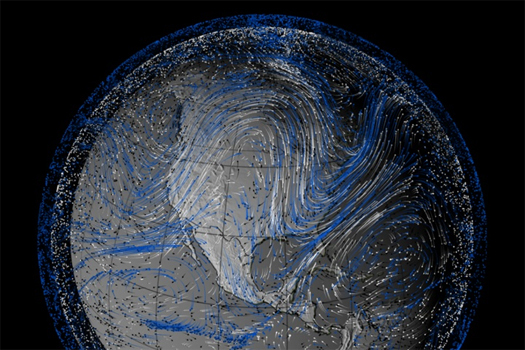 This presents to me a totally different geography of Earth, invisible indeed (but not all the times, think of course about clouds, ligntnings, wind in trees and high grass or storms, etc. ), but effective and highly variable over time.